Doha, Qatar – March 20, 2019 – More than 20 students from Northwestern University in Qatar (NU-Q) are interning for 10-weeks at international communication firms and news outlets in Washington D.C., New York City, London, Berlin, Stockholm, and Doha. As part of their junior year at NU-Q, students in the Journalism and Strategic Communication Program are offered residencies at various organizations where they intern full-time and explore professional career opportunities by working onsite in a professional environment. NU-Q students this year are interning at more than 20 organizations, including Ogilvy & Mather in London, The Guardian newspaper in New York., the Ministry of Interior in Doha, and AJ+ in Washington, D.C.
Asmahan Qarjouli is working at AJ+ - pitching stories in daily meetings, helping produce Facebook video content, and assisting with script writing and fact-checking. She is also producing two videos with the help of an assistant producer. Qarjouli has loved following AJ+’s content and has been especially interested in the one-minute explainer videos because of how unique and effective they are at telling stories when it comes to both hard news and feature pieces. 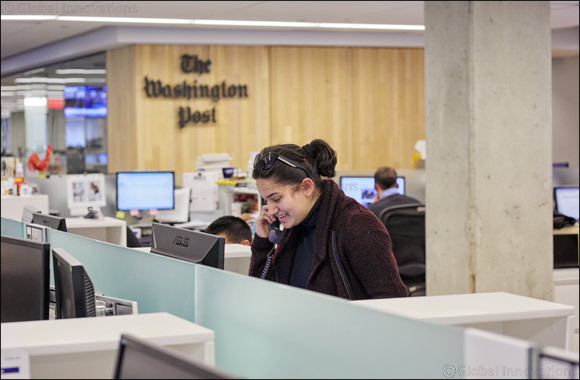 In past years, students have had interned at The Washington Post, Forbes magazine, National Geographic, VICE news, as well as strategic communication firms like Teneo Blue Rubicon, and Grayling. In addition to acquiring world-class experience, the internships provided students with an opportunity to get their work published by top media operations, gaining international readership and recognition for their efforts. This year, Hazar Kilani published multiple articles in The Guardian newspaper, following in the footsteps of her peers who had their work printed in The Washington Post, Forbes magazine, and on Al Jazeera’s website, among others. 'To develop skills in journalism and strategic communication, there's no substitute for actual professional experience, which this residency program offers. It is also an opportunity for the students to be mentored by professionals in the field and to make contacts which will be beneficial when they are in the job market,” said Mary Dedinsky, director of the Journalism and Strategic Communication Program. In addition to the journalism and strategic communication residency, NU-Q’s academic programs offer a myriad of experiences outside the classroom, including the Engage Chicago eight-week summer field study program, the Global Media Experience – where students visit organizations in New York City, and the Evanston Communication Exchange, which allows juniors to study at Northwestern’s home campus for a semester.